Snap will report its second quarterly results as a public company late Thursday. Snap Inc. (SNAP - Get Report) will have a lot to prove when it reports second-quarter results after Thursday's closing bell. Investors will be laser focused on whether the newly public social media company can demonstrate user growth, narrowing losses and momentum in its advertising business. On top of that, Snap also faces pressure to show that it's successfully fending off competition from Facebook Inc. (FB - Get Report) , which has mimicked feature after feature from its younger social media rival. TheStreet is hosting a live blog analyzing Snap's second-quarter earnings report on Tuesday afternoon. Please go here to check it out. Wall Street expects Snap to report a loss of 30 cents per share on roughly $186 million in sales. Daily active users are expected to increase modestly to 174 million, compared to the 166 million it had during the previous quarter. That number still pales in comparison to the 250 million daily users on Facebook's Instagram Stories -- its copycat version of Snapchat Stories, which allows users to post videos or images that disappear after 24 hours. Instagram Stories is also growing at a much faster clip than Snapchat Stories, adding 100 million new DAUs since January. But some have begun to acknowledge that Snap isn't going to grow as fast as Facebook or Instagram. Snap CEO Evan Spiegel's user strategy seems to indicate this. On the company's first-quarter earnings call, Spiegel and other executives said Snap isn't concerned with entering developing markets right now; instead, Snap is focusing on core geographies like North America and Europe, where engagement has proven to be consistently high. Will the Plant-Based 'Impossible Burger' Get FDA Approval? If user growth is going to chug along at a relatively slow pace, Snap will have to show investors that it can squeeze as much money as possible out of its existing user base. That's where the average revenue per user metric will come into focus. Analysts are looking for ARPU to jump to $1.07 per user, up from 90 cents during the previous quarter. Monness, Crespi, Hardt analyst James Cakmak contends that Thursday's results will be a "make or break quarter" for Snap, but that it can help save itself by demonstrating significant upside to ARPU. 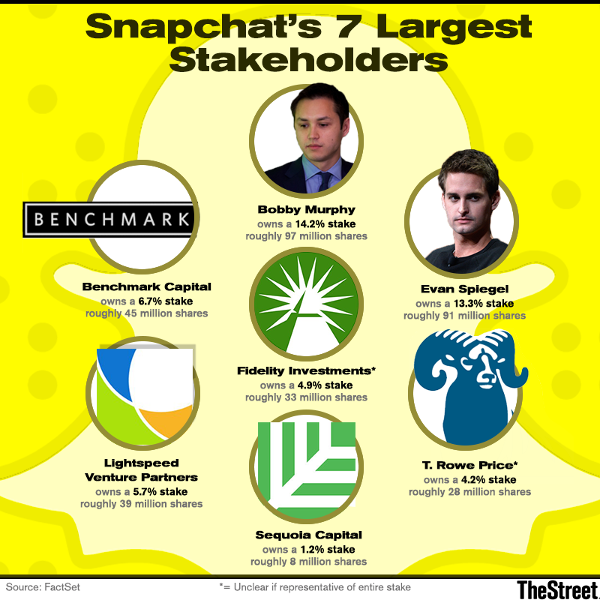 "We've defended Snap since day one, but now need to see monetization moving in the right direction while delivering outsized gains in the gross margin," Cakmak wrote in a note to investors. "In contrast with Facebook, we are less concerned on the absolute growth in users and focus more on the extracted value (ARPU) given the prioritization of affluent markets." Cakmak is among a small group of investors who still have a Buy rating on shares of Snap. Among 33 analysts surveyed by FactSet, only nine maintain a Buy rating on Snap, while 16 have Hold ratings and six have given it a Sell or the equivalent of a Sell rating. Wall Street has turned increasingly bearish on Snap in the months since its IPO, as the stock has tumbled 44.5% year to date. Several analysts noted that they might be more confident in the company if Snap gave some clues about what it's working on and how the next couple of quarters might be shaping up for them. Spiegel continues to remain opaque about Snap's product pipeline, saying on the latest earnings call that the company loves to "surprise our community" and that it should be a "fun rest of the year." Cakmak said he hopes the company will consider giving some guidance when it reports on Thursday. FBN Securities analyst Shebly Seyrafi said he wants greater visibility into Snap's product pipeline, especially as some near term headwinds remain, including Snap's 180-day lockup period expiration and the possibility that it may be excluded from a third major index provider. "We need to see that they have enough stuff in their product pipeline that they can further support the company," Seyrafi said. "Those kinds of product launches [like Snap Maps], if they're substantial enough, then they could drive user growth." What it comes down to, ultimately, is that Snap needs to restore some confidence among investors that it's not going to fade into irrelevancy like Twitter Inc. (TWTR - Get Report) or end up an acquisition target -- something that Seyrafi said he's not ruling out just yet, lest Snap show some positive momentum from its gloomy post-IPO performance. "I think they're a highly innovative company, I like the company, but I just can't make sense of the current stock price," Seyrafi added. At the time of publication, Action Alerts PLUS, which Jim Cramer co-manages as a charitable trust, was long FB.